These aren’t two-dimensional nightmarish scenarios designed to scare people into environmental action. They are compellingly fleshed-out visions of quite plausible alternative futures, which delve into energy, politics, agriculture, social, and even spiritual trends. What they do help make clear are the best strategies for preparing for and adapting to these possible futures. What do you see as the biggest challenges in our struggle to control our resources today? After a lifetime of focusing on the biological basis for existence, and then the energetic basis, I’ve now become more and more interested in money, ironically, after ignoring it for most of my life. On the downside of the energy peak, it’s actually the bubble economies that can unravel so fast, that become almost the most important thing in shaping the immediate future. That bubble economy is, of course, actually falling apart right now. So a lot of the mainstream sustainability strategies assume we have a growing and steady economy. Permaculture works from the basis that we can adapt and do these adaptions in an ad-hoc way from the bottom up, and we’ve been doing that essentially for 30 years without the support of government and corporations. I’m not saying that we’ve got all the answers, but there’s a lot of people out there who are modeling and have been modeling how creative responses are going to happen. And now a year later, as 2013 draws to a close, David Holmgren has published a new essay (a 24 page pdf download), which is an update of Future Scenarios, builds on Money Vs. Fossil Fuels, and expands his new focus on money and economy. The essay is titled Crash on Demand: Welcome to the Brown Tech Future. 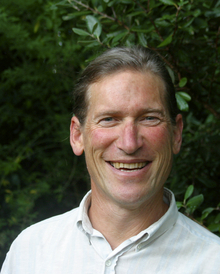 David’s argument is essentially that radical, but achievable, behaviour change from dependent consumers to responsible self-reliant producers (by some relatively small minority of the global middle class) has a chance of stopping the juggernaut of consumer capitalism from driving the world over the climate change cliff. It maybe a slim chance, but a better bet than current herculean efforts to get the elites to pull the right policy levers; whether by sweet promises of green tech profits or alternatively threats from mass movements shouting for less consumption. In the extensive discussions about money and economy, the influence of systems analyst Nicole Foss (Stoneleigh -The Automatic Earth) and economist Steve Keen (Debt Deflation) are strong and freely acknowledged. Holmgren believes that deflationary economics is the most powerful factor shaping our immediate future. …without radical behavioral and organizational change that would threaten the foundations of our growth economy, greenhouse gas emissions along with other environmental impacts will not decline. Economic recession is the only proven mechanism for a rapid reduction of greenhouse gas emissions and may now be the only real hope for maintaining the earth in a habitable state. 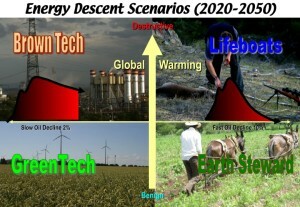 Holmgren makes the case that while it may be too late for the Green Tech scenario to materialize, it may still be possible to avoid the worst effects of the Brown Tech scenario (a 4 to 6 degree “Climate Cooker” Lifeboats scenario). A severe global economic collapse could switch off enough GGE to begin reversing climate change, so that the Earth Steward scenario of bioregional economies based on frugal rural agrarian living, assisted by resources salvaged from the collapsed global economy and the defunct national governments, might emerge in the long term future. It’s not a picture of a bright and shiny future, granted. The last 10 pages or so, however, I found to be quite stimulating, and opened up more possibilities for positive engagement. Topics discussed are Nested Scenarios (different scenarios co-existing at different scales); Investment and Divestment; Formal and Informal Economies; Alternative and Non-monetary Economies; Labor and Skill Vs Fossil Fuel and Technology; Brown Tech Possibilities; Actors at the Fringe; and Not Financial Terrorists (but Terra-ists with hands in the soil). There are also many great footnotes/links worth following up on. This is a highly recommended essay – essential reading for those trying to make sense of our long term future and how we can best make a positive difference. 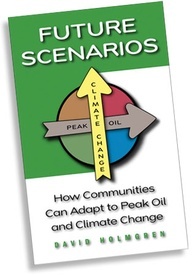 This entry was posted in Climate Change, Crash on Demand, Economy, Peak Oil, Permaculture and tagged climate change, David Holmgren, debt deflation, economic collapse, energy descent, future scenarios, peak oil, permaculture. thanks for the thoughtful write up…. David Holmgren discusses some of the questions raised in the debate on his “Crash on Demand” essay on London’s Shoreditch radio this Sunday evening.